Please note that Bitoomba Bitcoin Casino is now closed and we are unsure of the reasons for this. The review is kept below for editorial purposes but for now we do not recommend playing at this site if it does come back online. 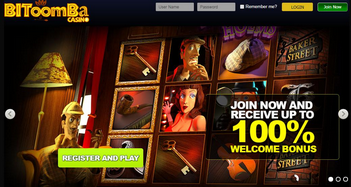 Bitoomba was one of the first Bitcoin casinos, opening their doors in early 2013. This operator has a mixed reputation at the start, and has created their own slot games which are available exclusively to Bitcoin gamblers. One of the key features here is that the server strings are provided to allow you to check the fairness of each game. This provably fair feature has been questioned, and may (technically speaking) be less robust than those of many other casinos. 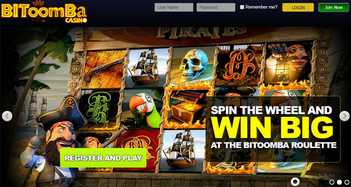 This review gives you a detailed overview of what to expect from the Bitoomba Bitcoin casino. First of all the financial side of playing here is covered. This includes bonus and ongoing promotional offers, plus how to make your deposits and withdrawals with BTC. After that I have outlined the games, comparing these with those offered by other casinos. At the end of the page you’ll find an analysis of the trust factors at this casino, along with my final thoughts. Your first deposit at Bitoomba will be matched at 100% up to 5 BTC max. This is generous compared to other Bitcoin casinos, though does have some terms and conditions attached. The first thing to note is that the bonus is for wagering purposes only. This means it gets removed when you make a withdrawal. You can keep any winnings you make from it, with the requirement that you wager 12x the combined bonus and deposit amount first. Games are weighted in their contribution to this play-through, with slots at 100%, most other games at 20% and Dice at 10%. These terms are standard across casinos accepting fiat currency as well as Bitcoin, with the play-through on the lower end of the scale. The main ongoing offer is a 25% bonus on every deposit you make for as long as you play at this casino. This has the same (12x combined) play-through requirement as the main bonus, along with the game weightings. These terms make this more generous than many of the comp schemes available at mainstream casinos. There are no one-off promotions or specials available at the time of writing. As you would expect at a Bitcoin casino, getting your BTC on board is a straightforward process. 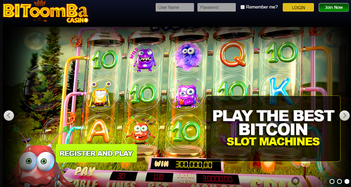 The back-end parts of this site are controlled by PlayFor, a platform which powers many Bitcoin casinos and uses Bitoomba games. There was one curious glitch at the registration phase. You are asked for a name (screen-name), e-mail address and password. The next box was to confirm your password, the one after that another password and then another confirm password. I was unable to register without filling in all 4 with the same information. This did not take too much away from an otherwise smooth experience. You can log on right away, with no e-mail confirmation step. Once you have registered and logged in, a deposit and ‘my account’ link will appear at the top of the screen. Clicking deposit gets you the recipient Id for your wallet to copy and paste, and a QR code for mobile wallets. Your BTC deposit will be split into casino coins at the rate of 1 BTC = 100 coins. The transaction speed is very fast, with most deposits going through immediately. You’ll also find this deposit information through the ‘my account’ link, along with withdrawal, bonus, history and promotions tabs. Withdrawing is quick and easy, you just type in your Bitcoin address, the amount to withdraw and hit the ‘Submit’ button. If you win a large amount then you might find the 5 BTC per 14 days restriction kicking in. There have been several complaints online involving pay outs, though none of these conclusively prove wrong-doing – they are more numerous than for many other Bitcoin casinos. There is only a limited selection of 16 games at the Bitoomba Casino. These are in-browser titles and work using HTML5 technology. This means you’ll be able to play them on any device including iPhone, iPad and Android systems. All of the games are created by Bitoomba, though some are available at other Bitcoin casinos which are powered by the PlayFor back-end. Unlike other PlayFor casinos, this operator does not include any BetSoft titles in its portfolio. 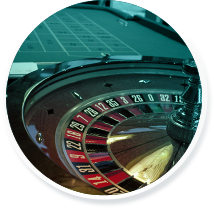 Table games fans will find Roulette, Blackjack, Blackjack Surrender and Baccarat. These are simple games, perfectly playable – though I found them ‘rough and ready’ compared to the same titles offered by the major software houses. What you will find with these games is that each comes with a server seed and server hash to confirm that the results are fair. There is no separate external game fairness certification at this casino. The slot games include Bubbles Factory, Dino Gold, Inspector Holmes and Wild Wild West. These are multi win-line video slots games and have nice graphics with some quirky animations on the reels. There are wilds, scatters and free spins available – though none go as far as having animated feature rounds. I liked these games and would say they are comparable with those from Real Time Gaming, while not being as advanced as those from BetSoft or MicroGaming. Additional games include on Video Poker title. There is also an entertaining Russian roulette game, where you get to choose the number of bullets to increase your pay-outs. You will also find a dice game, though this is more a case of guessing a random number than anything like a normal casino game. This casino is one of the longest running BTC casino operations, and has a mixed reputation. May reviews cite this as a legitimate operation, while others question the games and payment processing. There are no major scandals to report, just an uncomfortably large number of questions about the legitimacy of the game results. The provably fair technology has been questioned by the Bitcoin community. This is provided for some of the games at Bitoomba, though not all. In addition the results of all games are published the following day. Without knowing the math behind the proof of fairness, we only have the comments of one individual to go on. This individual highlights a way in which (theoretically) the proof of fairness information could be tampered with. Bonuses here are generous, with lower play-through requirements than many casinos. I would like to see a gaming license and contact details of the owners. As things stand there is nothing to stop you enjoying the unique games here, safe in the knowledge that this Bitcoin casino has a great reputation for looking after their players. Just be aware that there have been delays with payments to players in the past.